Japan may be known as the land of cute things, but beneath the surface of big eyes and round faces lies the terrible truth: Japan is home to some of the scariest animals on the planet. And that’s why today we’re counting down the top five creepiest Japanese animals. 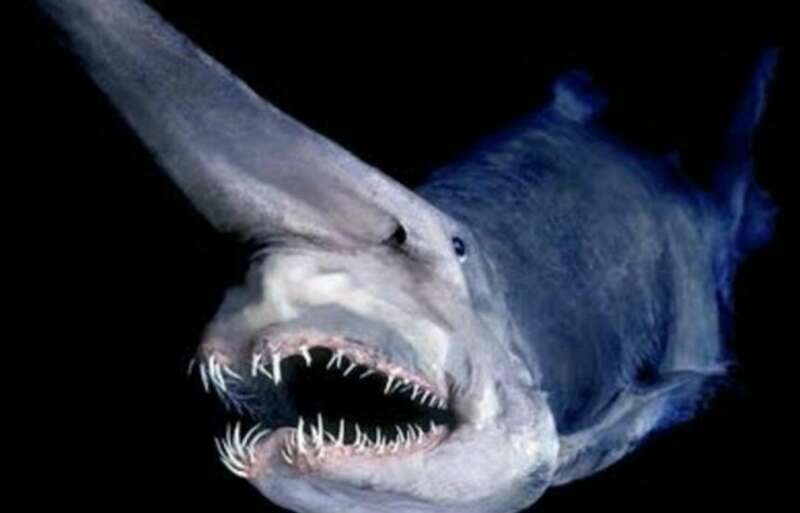 Say hello to the Goblin Shark, known in Japanese as mitsukurizame or tenguzame with tengu being a mythical creature with a long nose. Goblin sharks are found outside of Japan as well, but Japan has the most cases of actually catching them, usually by accident. They live deep below the ocean surface, as far down as 1,200 meters (3,937 ft), and can grow up to 6.2 meters (20 ft) and 210 kilograms (460 lbs). Sure, that may not be Great White size, but that doesn’t matter because the intimidation factor is off the charts here. Just look at those jagged, barbed-wire-like teeth, the sawblade-like nose, and the eyes of a madman who can’t be reasoned with. These guys are literally “living fossils,” the last members of an ancient lineage dating back 125 million years that still retains the same “primitive” traits. Salamanders aren’t usually so bad, just some slippery little dudes that climb up walls and eat pests. The problem arises, however, when the salamanders are suddenly 1.9 meters (6.2 ft) long. Japan and China’s Giant Salamanders (osanshouo in Japanese) are the largest amphibians in the world. They typically spend their time in the rivers of northern Kyushu and western Honshu (yet another reason to never go in the water), blending in with stones and mud so they can catch and eat basically anything that comes by: insects, fish, mice, crabs, hopes and dreams, pretty much anything. They also cover their skin in mucus, which acts like a thin shield against scrapes and parasites. Their first act of self-defense is producing a milky, sticky secretion, making it not only one of the creepiest things we’ve ever seen, but one of the grossest as well. Coconut crabs (known as yashigani in Japanese) may have a silly name, but not once you know the meaning behind it. They got their name because their claws are strong enough to crack open a coconut. These things are not only the largest land-living arthropods in the world, but the largest land-living invertebrates in the world too. With a leg span of up to 0.9 meters (about 3 ft) and weighing up to 4 kilograms (9 lbs), it’s no wonder that they have no natural predators, aside from humans and other coconut crabs. Now you’re probably thinking: “Silly little crows? Oh come on, they’re not scary at all!” We’re not talking about any “silly little crows” here. We’re talking about Japanese crows (known as karasu), 0.6-meter-long (about 2 ft) intimidation machines found all over Japan that don’t rely on just their appearance and shrill call to horrify passerby, but their terrifyingly high level of intelligence as well. In Japan, it’s not uncommon to hear about “crow attacks,” crows swooping from the sky to peck somebody’s head who never heard it coming. Whether the person is just out walking, riding a bike or taking out the trash, getting attacked by a crow or group of crows is something to be prepared for whenever you hear caw caw. And that’s the creepiest thing about the crows, which makes them number one on the list. The other animals may look scarier, but they’re usually perfectly happy to leave you alone. But not crows. They’ll watch you, think about you, and then do whatever they want, whenever they want. Maybe they’ll steal your food. Maybe they’ll whack you on the head. Maybe they won’t do anything. We are all at their mercy.